Heed these best (and worst) practices when it comes to cleaning up and caring for your wooden deck, and you'll be able to enjoy your outdoor living room for seasons to come. A deck is a plein-air addition to your home. Like the space inside your residence, it needs regular cleaning and maintenance to remain habitable and safe. Decks made of composites require less maintenance than wooden decks, but there’s no such thing as a self-cleaning deck or a deck that lasts forever. By doing what’s good for the wood and avoiding what’s not, however, you’ll get more life from your outdoor living space. DO clean the deck thoroughly once a year. DON’T go overboard with the high-powered washer. 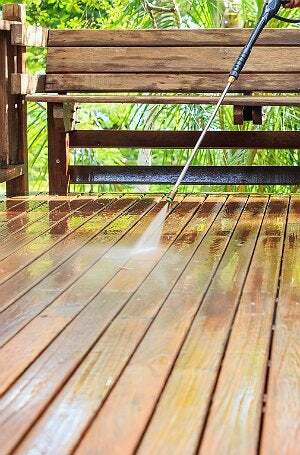 The power or pressure washer is a time- and labor-saving tool, but in unsteady hands, it can make your deck look like wood-boring beetle larvae have been at work. Sweep the nozzle along the wood grain at a slight angle about 8 inches from the deck surface. Move the nozzle at all times while the trigger is engaged. DO cover nearby shrubbery before you begin. The chemicals in cleaners and sealers can harm or kill plants that are hit with overspray. Cover all nearby vegetation with a tarp or plastic sheet before you start, but drape it loosely to allow air circulation. DON’T clean the deck with chlorine bleach. Unless, of course, you don’t mind stripping the wood of its natural color and damaging its cellular structure. Oxygen bleach is an all-purpose alternative that won’t wash out colors or harm plants, but it’s still not appropriate for redwood. 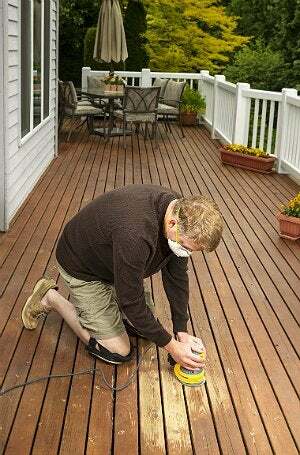 DO sand your deck before sealing. It can take up to 48 hours for the deck to fully dry. At that point, lightly sand the surface to remove splintery or fuzzy patches caused by pressure-washing the deck. A pole sander with 80-grit sandpaper will suffice; a power sander is overkill. Then seal the deck to protect from cracking, cupping, and warping. A clear sealer lasts longer; a tinted stain or sealant fades quickly with lots of foot traffic. DON’T use paint as a sealant. Paint looks nice when it’s first applied, but it looks downright distressed before long. If you then decide to refinish the deck with an alternative sealant, you’ll need to first remove all the paint with a stripper or sander. Finishes that leave a film rather than penetrating the wood—including varnishes and lacquer—will peel and crack. Consider synthetic sealants, as some oil-based products attract mildew and algae. 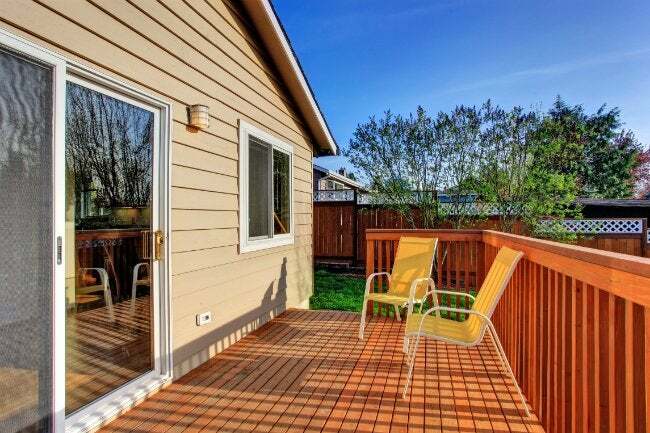 Semi-transparent finishes protect the deck from sun damage and add color to the wood if that’s important to you. DO clean the deck at routine intervals. The room and walls of your home protect its interior from rain, snow, sun, and wind, but the uncovered deck endures whatever Nature delivers. Prevent water damage throughout the season—and during the off-season—by regularly sweeping away puddled water, leaves, branches, and other debris. Use a plastic shovel if you get more snow than a push broom can handle. DON’T assume that pressure-treated wood is maintenance-free. It might resist rot and insect infestation, but pressure-treated wood still needs to be cleaned and sealed to withstand water and solar damage. Use products made for pressure-treated wood. DO be vigilant about damage. Inspect periodically for soft or splintered spots, loose nails and deck attachments, and split or rotten planks. Promptly fix any damage that presents a health or safety hazard. Complete other repairs before your annual deep-clean. DON’T use natural materials under deck furniture. Protect the wood deck from scrapes inflicted by chair and table legs, but don’t use rugs made of natural fibers such as jute and bamboo: These absorb moisture and promote mildew. Rugs made of recycled plastics won’t cause these problems, and they’ll last longer.